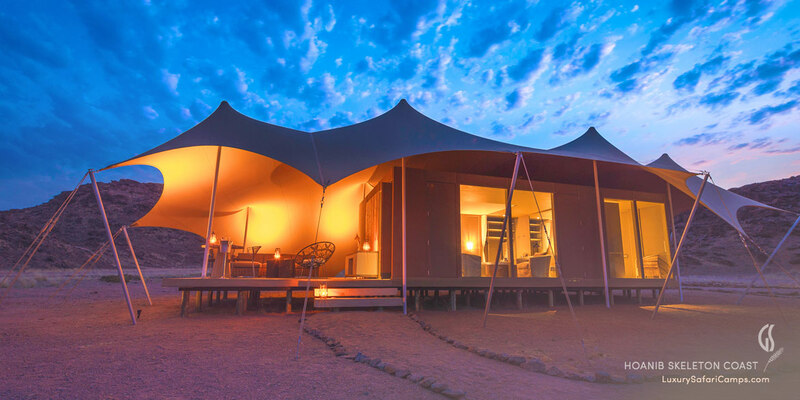 Hoanib Skeleton Coast Camp is located in a remote area of Kaokoveld in the Skeleton Coast region. Unaffected by the deep fogs of the coastline, the lodge’s location offers greater advantages to explore this isolated area of Namibia with rare fauna. 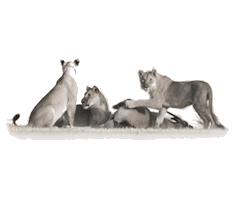 Here at Hoanib Skeleton Coast we can discover an astonishing array of desert-adapted species; most notably the Desert lions of Namibia. 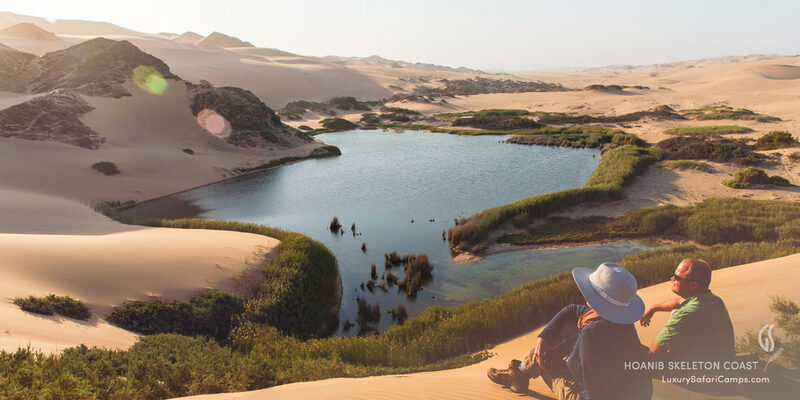 Specialized guided excursions bring us to the stark Skeleton Coast with its wild scenery, remains of old shipwrecks and colonies of Cape fur seals, their banshee calls adding to the eerie atmosphere of this landscape. Hoanib Skeleton Coast Camp is a unique location favored by naturalists and researchers committed to studying and help conserve desert-adapted lion, brown hyaena and other rare species. In a very remote area of Kaokoveld, between the unique Palmwag concession and iconic Skeleton Coast National Park. 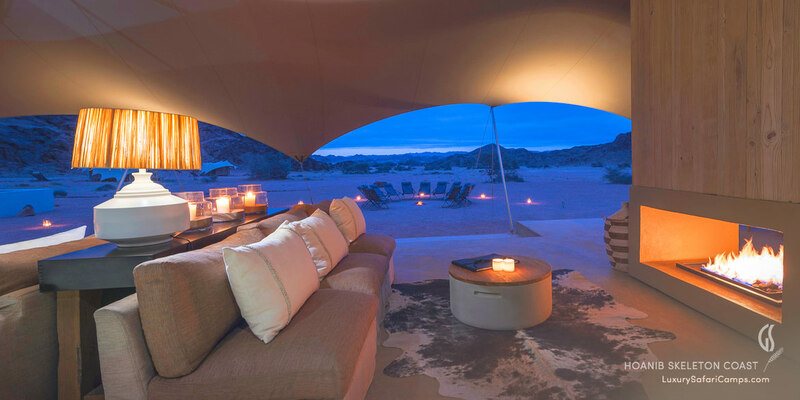 The Hoanib Skeleton Coast Camp is in an incredibly scenic valley, at the confluence of two tributaries of the dry Hoanib River in the northern Palmwag. An area inaccessible to cars, the wild privacy offered here is unmatched. We fly our guests in to the private camp airstrip with all Guided Safaris® journeys. 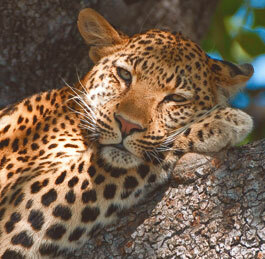 We offer 4x4 professionally guided game drives as well as a scenic flight for longer stay travelers (3 nights or more). 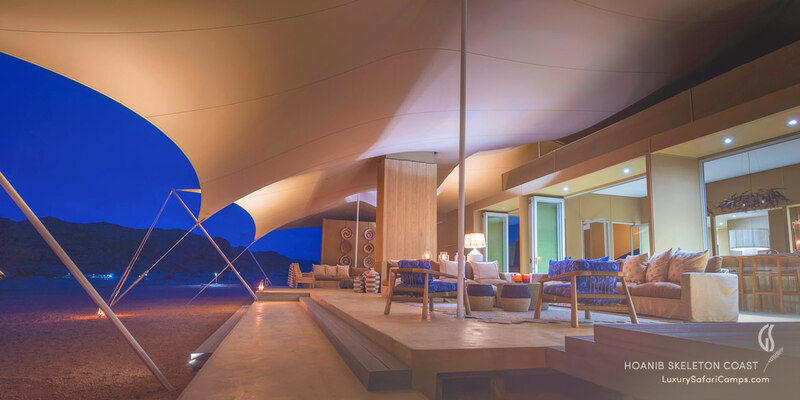 An eco-luxury concept, the Hoanib Skeleton Coast Camp is completely powered by green solar energy. A joint community venture with the local Torra, Anabeb and Sesfontein conservancies we support sustainable tourism in the region. 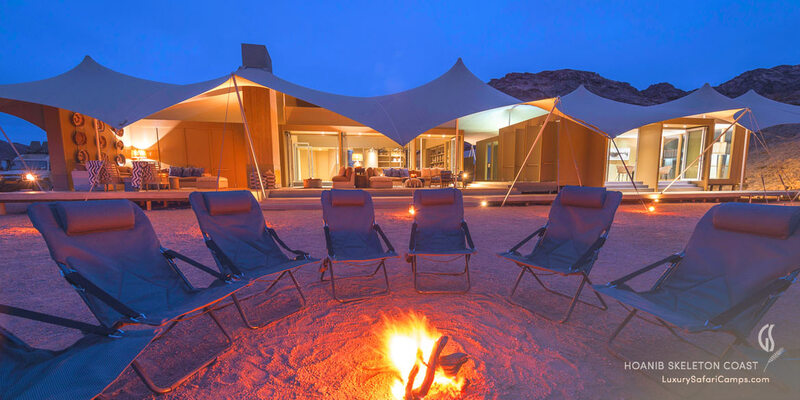 With 8 sprawling villas (including a special 2-bedroom family tent), Hoanib Skeleton Coast is the most exclusive camp in the region. The main lodge area and inviting pool offer panoramic views over the wild, rugged valley sloping out toward the dry Hoanib River. Please note that due to the nature of the wild and adventurous setting, the camp is unable to support wheelchair access given the uneven terrain and raised decks. For individuals with difficulty in walking we do have rooms closer to the main lodge areas, for ease and comfort. Comfortable cotton clothing (neutral colors are best) and your favorite walking sneakers are pretty much all you need to bring along with your daily preferred toiletries. We provide organic, environmentally-friendly body soaps and lotions in all our suites at Hoanib Skeleton Coast. Given the ease of daily complimentary laundry service at our camps you do not need to pack much: Our settings are very casual and informal and guests are encouraged to dress comfortably for the season and adventure ahead. A Safari Packing List will be provided to guests holding a paid reservation with a Guided Safaris® travel confirmation. We operate daily scheduled flights to our locations - access by air only and takes about an hour of flying time. We can help fly you in from most international airports in Southern Africa and offer complete assistance with flight reservations and taking care of your transfers. Private air charters are possible, on special request if you need more flexibility in your schedule. Book our special packages featuring more of our luxury camps and take advantage of great seasonal savings for a longer stay on safari. 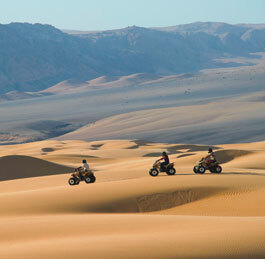 Child policy at Hoanib Skeleton Coast: Minimum age is 6 years. 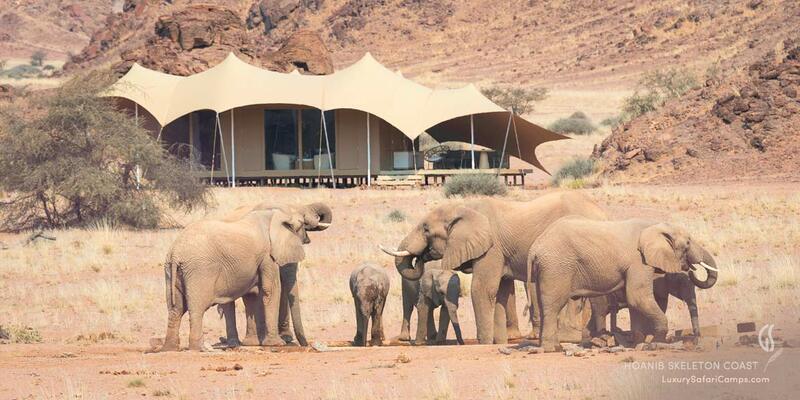 The camp can be privately booked to accommodate younger guests. 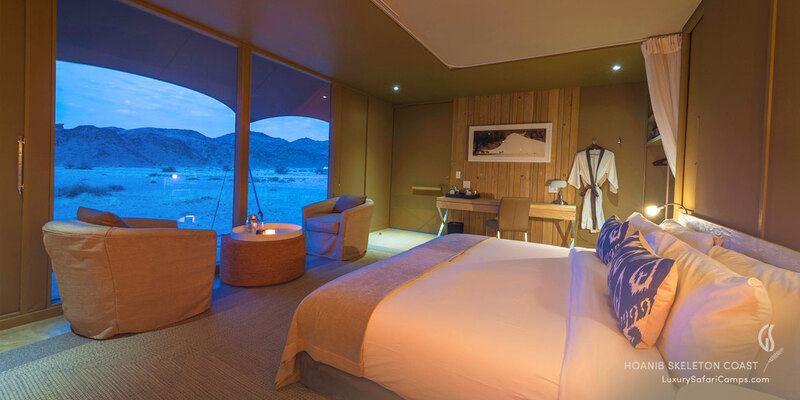 We offer a private Family Suite with 2 bedrooms at Hoanib Skeleton Coast. For families with kids between 6 and 12 years, private activities need to be booked and paid for (subject to availability).